Share the post "The Rear View Mirror"
On my way out of town this morning I noticed something again that I’ve often wondered about when having seen it in the past. It all started when I pulled up to astop light and glanced over to the vehicle that was along side me. In seeing what he had hanging from his rear view mirror re-kindled thoughts as well as memory. I’m not sure when this business of hanging things from your rear view mirror got started, but I do think it’s become far too common these days. 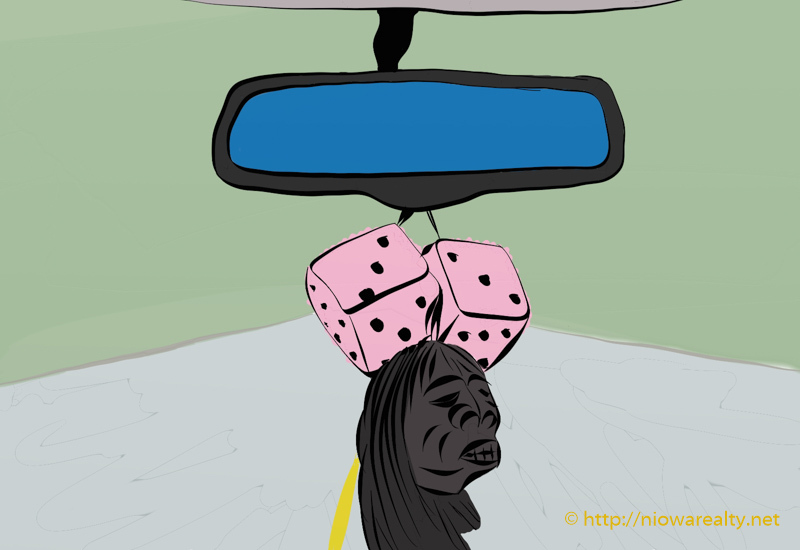 The first time I remember seeing something hanging from a rear view mirror was a guy driving a nineteen fifty something car with a pair of hairy dice hanging from it. I didn’t find it at all amusing at the time and considered it a bit clownish. Another memory from years past was seeing what appeared to be a shrunken head hanging from the rear view mirror of a 1957 Chevrolet. I couldn’t believe that young man thought something as garish as a head to be an appropriate accessory to hang from the mirror of that classic car. Of late, the most common of things I find hanging are what appear to be Mardi Gras beads of endless lengths and colors. As well, I see air fresheners of most being in the shape of Christmas trees. Every time I see them I think they must have really smelly cars and want to mask the odor with pine scented air fresheners. I would think if their vehicles smelled that bad, they would clean the insides rather than mask the odors. Someone who worked at the factory here that makes fresheners gave me one that smelled like cinnamon. I thought I’d give it a try since it was one that hooked over the sun visor. I didn’t have it in my car very long because every time I got in my car, I was overwhelmed with the smell of pumpkin pie. After several days, the smell became so annoying that I threw it away. I love pumpkin pie, but I don’t like feeling that I’m seated behind the wheel and driving a pumpkin pie that gives curb service. We’ve all heard how texting has caused more accidents than most want to admit. What about having things hanging from rear view mirrors that obstruct the driver’s view? They’ve always said that if you hold a pencil up close, you’ll miss seeing someone on a bike or motorcycle. I would certainly find things hanging from my rear view mirror most annoying as well as in bad taste. I know not too many years ago, there was a fad of people hanging something with a picture on it that was about the size of a normal playing card. I never looked close enough to see what type of pictures were on those laminated cards, but from a distance they appeared to be photos of young people. A number of years ago I had to drive several elderly relatives a great distance in their car as they thought my being younger and more used to Interstate driving was the better choice. As it was, the older gentleman had a donkey in his back window who’s head bobbed with the movement of the car. Hour after hour I would glance in the rear view mirror and see that head in motion. It is no wonder that I still today find anything that moves in the rear window of a car very dis-tasteful. The things I see in the rear windows of vehicles is the subject of another day. We have the once a year smoke free day, so why don’t we have a once a year naked rear view mirror day? I wonder if there will be fewer accident reports that day.